Rabbits are fairly small animals and, thus do not require a lot of space. Though this is true, rabbits can still benefit from having a chance to stretch their legs regularly. 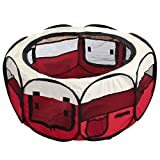 Because large rabbit hutches and cages can be quite expensive, however, many rabbit owners choose to go the alternative route of purchasing a playpen for their rabbit. 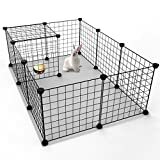 Rabbit playpens are temporary containment structures designed to give your rabbit a chance to get out of his cage for a while without the risk of escape. If you are looking for a simple way to give your rabbit an opportunity to get some additional exercise but do not want to let him roam freely around your home, a rabbit pen or playpen may be just what you need. What is a Rabbit Playpen? Rabbit pens and playpens come in two basic forms - one for indoor and one for outdoor use. Most rabbit playpens are fairly simple in design, consisting of foldable or detachable wire panels that can be arranged in a roughly circular, square or rectangular shape. The walls of these pens are typically 18 to 24 inches high to prevent your rabbit from jumping out and to keep other pets from getting in. These playpens come in various sizes and some models allow the user to purchase multiple playpens in order to combine them and thus expand the size of the enclosure. The main benefit associated with rabbit pens and playpens is that they provide your rabbit with a safe place to exercise and play outside his cage. Inside your home other pets, electrical wires and various household objects could endanger your rabbit, but a playpen keeps your rabbit confined to a safe area. The same is true for outdoor playpens - they give your rabbit a chance to leave his cage and stretch his legs while removing the risk of escape. In addition to these basic benefits, many rabbit playpens offer additional features to make them even more convenient to pet owners. Some playpens come with an optional mat that can be slipped under the playpen to protect hardwood floors and to make clean-up less of a hassle. Other models incorporate a door or passageway that can be used to connect the playpen to other enclosures or directly to your rabbit's cage. Many outdoor playpens come with a roof to protect your rabbit from predators. Before you go out and buy a pen or playpen for your rabbit, think about what kind of features you want it to have. First you need to decide whether you intend to use the playpen indoors or outdoors, then you should think about what size enclosure you want. Rabbit playpens vary in size, offering an average of 8 to 10 square feet of enclosed space. If you intend to use your playpen for multiple rabbits, it may be wise to purchase more than one playpen and combine them if you can. While you are researching your options, pay attention to customer reviews in order to determine which companies and products are the most reliable. While the price of the product should definitely be a factor in choosing your rabbit playpen, the safety of your pet should be your first concern. Once you select and purchase a playpen you will be able to provide your rabbit with a safe place to exercise and play - what more could any rabbit ask for?